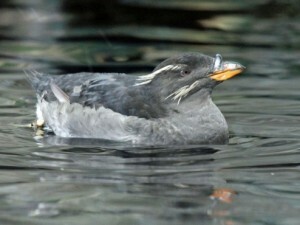 The Rhinoceros Auklet (Cerorhinca monocerata) is named for the unique horn-like projection that appears on its bill during the breeding season. 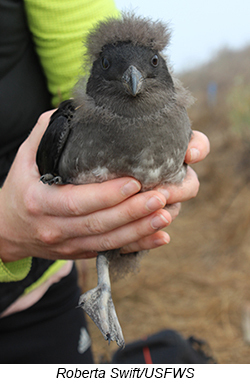 These auklets have a compact body with short wings and tail. They are built for diving so their feet are set far back on their body making them a bit awkward on land. Dark gray breeding season plumage and a few fancy white feathers around the head complete the breeding season ensemble. These stocky birds are the only member of their genus (Cerorhinca) and are closely related to puffins. Rhinoceros Auklets, or RHAU as they are known in the birding world, spend the day at sea and wait for nightfall to bring fish to their chicks, perhaps an adaptation to keep their single chick’s location and meal away from hungry gulls. Their burrows are impressive, dug into soft soil and often 20 feet deep with multiple twists and turns before ending in a nest chamber lined with feathers, moss, or twigs. Eggs hatch after about 45 days of incubation and parents feed their chick for 50 days in the nest, which is quite long compared to other seabirds. Their diet of fish and squid varies depending on what is available, but may include juvenile rockfish, anchovy, herring, sand lance smelt, crustaceans, and squid. They are skilled divers, using their wings to propel them underwater to 300 feet! RHAU can also fly fast, 30-50 mph and have a lifespan of 7-8 years. RHAU are particularly susceptible to oil spills (many were killed by the Apex Houston spill in 1986), fishing bycatch, and also to land predators like raccoons that can wreak havoc on burrow nests. Their range is the North Pacific Ocean and these auklets nest in a large area, from California to the Aleutian Islands to Japan. RHAU were extirpated (locally extinct) in California by 1860, and have only returned to the historic part of their range in the last four decades. 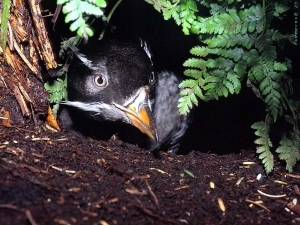 To restore the island, managers eradicated rats from the Islands in 1972, allowing Rhinoceros Auklets to return. The current world population is estimated to be 2-3 million individuals, although this is a very rough estimate due to their nighttime activity and hidden nests. Learn more about Rhinoceros Auklets on SIMoN or download information from U.S Fish & Wildlife Service.